Hair braiding involves a learning process. But once you know how to braid hair, you can transform your own or someone else's hair into a cute new style in just a few minutes. 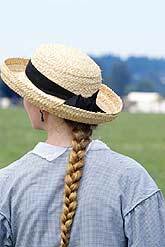 Braided hair is excellent for playing sports, swimming, riding motorcycles and traveling. It keeps hair neat, untangled and stylish. Here are some easy instructions on how to braid hair. The hair should be clean and dry. If it is wavy or curly, you may want to blow dry it straight first so the braid has a more even texture. Add some styling gel to smooth any flyaways and make the hair more manageable. Comb the hair to remove tangles. Secure the end of the braid with a covered rubber band. Add a bow or barrette as desired. Be sure to pull the portions of hair as evenly as possible so the tension remains consistent. If the tension is tighter on one side, your braid will twist to one side instead of lying flat. Avoid pulling too hard, as this may lead to hair damage. Comb your hair before you begin and remove any tangles. Divide the hair into three even sections. Some people have found that if you braid your hair when it's damp, say 30 minutes to an hour after a shower or bath, it does not get frizzy and is easier to work with. Continue the process until the braid is complete. To braid very long hair, you may have to free a hand to pull the sections through. Secure the developing braid by pressing your knuckles into it as you shift your hands for the next cross. Use a covered elastic to secure the braid at the end and decorate as desired. The first time you try to braid hair, it will go slowly. Practice your technique and be patient until you know how to braid hair. It may take some time to discover your rhythm. Braiding will become much easier with continued practice. If you're braiding a young child's hair, ask that she keep her head still. Give her a hand mirror so she can watch you do the braiding. If her hair is too thin and fine for an elastic to hold the braid, use pipe cleaners. These come in many colors and children usually have them readily available. When you're learning how to braid hair, it might be beneficial to visit a hair salon where they do braiding and watch the stylists braid their clients' hair. Another good practice technique is to braid the hair of a doll or hair mannequin. What is a spin brush for your skin? Which hairstyling tools to choose for curly hair?